Written on November 29, 2016 . Posted in Liberal Arts. 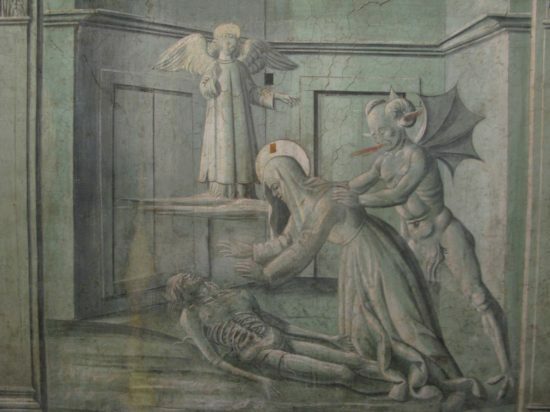 Suzanne Scanlan (Lecturer, History of Art + Visual Culture) recently gave a talk entitled, Angels and Demons: Images Made for Women in Fifteenth-Century Rome, at the Bard Microcollege in Holyoke, MA. The lecture was drawn from her forthcoming book Divine and Demonic Imagery at Tor de’Specchi, 1400-1500: Religious Women & Art in Fifteenth-Century Rome published by Amsterdam University Press. Research for this project was partially funded by the RISD Professional Development Fund.